When news of the D-Day invasion of France by Allied Forces reached the United States that morning, most of Organized Baseball honored the solemn event by canceling the games scheduled for June 6, 1944. The Cardinals, though, chose to play an exhibition game. On D-Day, the United States and its allies crossed the English Channel and launched an offensive that significantly helped lead to the defeat of Nazi Germany in World War II. More than 9,000 Allied soldiers died or were wounded in the effort. Two National League games _ Phillies vs. Dodgers at Brooklyn and Reds vs. Pirates at Pittsburgh _ were scheduled for Tuesday, June 6, 1944. Both were called off in deference to the D-Day invasion. No American League games had been scheduled for that date. In addition, four minor-league groups _ Appalachian League, American Association, Eastern League and International League _ called off all games on the June 6 schedule. Because of the time difference between Europe and the United States, news of the invasion reached America in time for the ballgames that day to be canceled. The Cardinals decided to honor their commitment to play an exhibition that night in Wilmington, Del., against the Wilmington Blue Rocks, a Phillies affiliate in the Inter-State League. It was part of a long, winding road trip for the two-time defending National League champions. On May 26, 1944, the Cardinals embarked on a 17-game road swing that began in Brooklyn and took them to New York, Boston and Philadelphia before ending at Cincinnati on June 11. After playing the Phillies at Philadelphia on June 4, the Cardinals weren’t scheduled to play their next regular-season game until June 8 at Cincinnati. Rather than enjoy off-days, though, the Cardinals were scheduled to play an exhibition with their minor-league affiliate at Allentown, Pa., on June 5 before going to Wilmington for the June 6 exhibition versus the Blue Rocks. In the June 5 exhibition at Allentown, the Cardinals put on a power display for the crowd of 3,091. Stan Musial and Danny Litwhiler each hit two home runs and Walker Cooper had one home run in the Cardinals’ 22-4 victory. 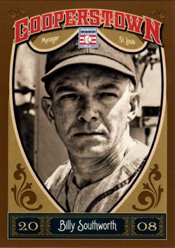 Cardinals manager Billy Southworth started Freddy Schmidt, who pitched for Allentown in 1942, as a gesture to the local fans, The Sporting News reported. A total of 17 Cardinals played and the others rotated as base coaches so the fans could see all the big-league players. Before a crowd of 3,668, the Cardinals did most of their damage in the seventh. With the score tied at 1-1, Marty Marion opened with a single and George Fallon (a second baseman who would hit .199 that season) followed with a two-run home run to left off Michotte. After Johnny Hopp, pinch-hitting for pitcher Ted Wilks, walked, Augie Bergamo tripled, scoring pitcher Harry Brecheen, pinch-running for Hopp. After the Phillies farmhands batted in their half of the seventh, the game was halted by rain. The 4-1 victory came at a cost to the Cardinals. Third baseman Whitey Kurowski injured his leg and would miss the next two regular-season games. The Cardinals were supposed to leave Philadelphia by train for Cincinnati on June 7, but Leo Ward, Cardinals traveling secretary, could get accommodations for only 14. Southworth and the Cardinals starting players, including pitcher Max Lanier, who was scheduled to start the June 8 game at Cincinnati, boarded the train. The rest of the team waited for another train, which departed Philadelphia at 1:08 a.m. on June 8, and arrived in Cincinnati less than three hours before game time, The Sporting News reported. The Cardinals won 11 of the 17 regular-season games on the trip and went home with a 32-16 record. Having survived their odyssey, they went on to clinch their third consecutive National League pennant.